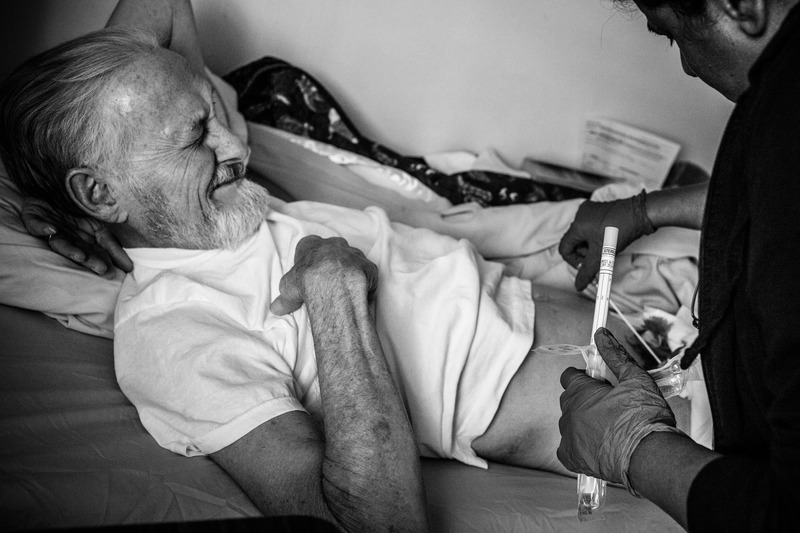 John Gillis (the prisoner's name has been changed at his request), age 73, grimaces while an open wound - a development due to terminal colon cancer - is treated by a nurse in the hospice care wing of California Medical Facility (CMF) on December 17, 2013 in Vacaville, California. Gillis is serving a 30 year sentence for a crime he chose to not disclose. He was diagnosed with cancer in April 2013; doctors currently expect him to live another three months. Gillis says he has lost 70 pounds over the last six weeks, though he won't take pain medication. Gillis believes terminal patients should be allowed out of prison, stating, "there's no need for [holding terminal patients in prison] - who's a threat to society in here?" While California has a compassionate release program for terminal patients in the last six months of life, the decision is ultimately made by judges, who frequently deny the request. CMF's hospice was the first of it's kind, originally created in the 1980s during the HIV/AIDS epidemic. The program currently holds 17 beds. When a patient arrives in CMF's hospice, doctors immediately apply for compassionate release.